This trip is a fascinating mixture of big city and modern history in Berlin, imperial capitals in Goslar and Potsdam, medieval towns in Quedlinburg and Wittenberg, and wonderful scenery in the Harz mountains. Modern ‘iron curtain’ history in the old GDR also features. A highlight of the holiday is the iconic walk along the Goetheweg (Goethe’s Path) to the Brocken – the highest point of the Harz, and a meeting place for witches described in Goethe’s Faust. Day One: Flight to Berlin, short transfer to your hotel for three nights bed and breakfast accommodation. Berlin’s Checkpoint Charlie, Brandenburg Gate and Jesse Owens’ Olympic Stadium spring immediately to mind, but this is also a thriving, newly European capital city with emblematic buildings such as the new Bundestag – well worth a visit! Berlin is also home to some of the best museums around – all conveniently clustered together on Museum Island – such as the marvellous Museum of Antiquities and the recently-reopened Neues Museum, with its wonderful Egyptology Collection. Days Two and Three: There is a half-day city tour, and a half-day walking excursion. The rest of your time is free for you to explore the city and visit some of the wonderful museums. Walk 1: The Waansee. You take the S-bahn to Waansee station for a level 6-mile walk along the Waansee (Lake Waan, part of the River Havel). Passing sailing clubs and the ‘Peacock Island’ nature reserve, you reach the famous Glienicker Bridge, the bridge between Berlin and Potsdam, the usual point of exchange for Cold War spies. From here you catch the bus back to Wannsee station or, if you prefer, continue into the centre of Potsdam, 3 miles further on. Day Four: You leave Berlin and travel through the former East Germany to Wittenberg where, in 1517, Luther famously nailed his “95 Theses’’ to the door of the Castle Church – challenging the teachings of the Church and the authority of the Pope. Today you also stop in picturesque Quedlinburg (like Wittenberg, also on the UNESCO World Heritage list), a maze of cobbled streets and quaint fairy-tale houses, overlooked by its 16th century castle, before continuing to Goslar for three nights half board accommodation. 190 miles today. Days Five and Six: Goslar is also on the UNESCO World Heritage list, thanks to its old town of decorated half-timbered houses, and was an important seat of the Holy Roman Empire – the Imperial Palace was founded in 1040, but reconstructed in the 19th century. There are two included walking excursions from Goslar. Walk 2: Around the Bocksberg. Your first walk in the Harz is a half day walk from the pretty spa town and ski resort of Hahnenklee, 10 miles south of Goslar. Your circular route is around the Bocksberg Mountain, partly on forest tracks with good views on all sides of the mountain. 4 miles, 130m of ascent and descent. After your walk there is time to look at Hahnenklee, with its lake and wooden Norwegian-style Church which dates from 1907. 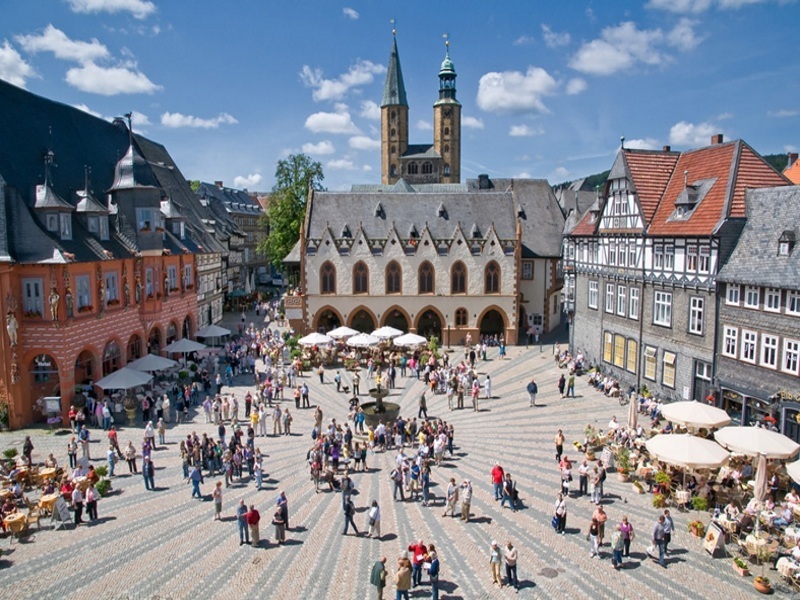 You also have a guided walking tour of Goslar today. Walk 3: Goethe’s Path to the Brocken (full day). After a 20-minute coach transfer to the Torfhaus National Park Visitors Centre, you follow (roughly) in Goethe’s 1777 footsteps, crossing unusual high altitude peat moors and following an old watercourse. You then cross the old ‘inner border’ between East and West Germany which, having remained untouched for 37 years, is a modern-day treasure trove of flora and fauna: the 858 mile ‘death strip’ is now Europe’s largest nature reserve. You reach the Brocken summit, which housed the world’s first television tower (built to broadcast the 1936 Olympics), and Stasi and Soviet military listening posts, where you will have time to visit the Brockenhaus museum (entrance fee applies), and have a drink in the Witches’ Flight Café! After your stop atop the Brocken, you walk down towards the mountain resort of Schierke for your transfer back to Goslar. Total: 9 miles, 330m ascent, 500m descent. Day Seven: You leave the Harz and travel to Potsdam for a short sightseeing tour. The lakes and rivers contrast beautifully with the numerous palaces and castles – such as the Cecilienhof (which hosted the 1945 conference where the United States, Russia and Britain decided on the post-war future of Germany) and the UNESCO-listed Sanssouci Palace, in its enormous park. The walled-off “Forbidden City”, with its Russian villas, was once controlled by the KGB, and gives an insight into Cold War Potsdam. One nights bed and breakfast accommodation has been reserved for you in Potsdam. 155 miles today. There has been a hotel here for over 500 years. Steeped in tradition with a unique ambience, the hotel has a fine location on the ancient Market Square. There is a bar and a café with a terrace on the square. Bedrooms have bath or bath with shower, wc, tv, hairdryer. Wifi is free throughout the hotel. HOTEL KAISERWORTH 4*, Goslar (three nights) There has been a hotel here for over 500 years. Steeped in tradition with a unique ambience, the hotel has a fine location on the ancient Market Square. There is a bar and a café with a terrace on the square. Bedrooms have bath or bath with shower, wc, tv, hairdryer. Wifi is free throughout the hotel. MERCURE HOTEL 3*, Potsdam (one night) The Mercure Hotel Potsdam offers 210 comfortable, air-conditioned rooms with shower, wc, hairdryer, tv, phone, safety deposit box, and minibar. There is bar, restaurant and free wifi in reception. It is located in the city centre, right by the wharf and 200m from the main train station. Sanssouci and all the major sights of Potsdam are 5-20 minutes walk away.